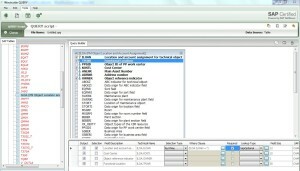 Winshuttle Query enables users to extract timely SAP Plant Maintenance (PM) notification data quickly and easily. With Query, users can view SAP PM notification data in an easy-to-use Excel spreadsheet or a web-based form. This improved access to timely SAP data helps companies keep plant output and performance at maximum levels. In addition, Winshuttle Central and Transaction enable users to use web-based forms or Excel spreadsheets to create a complete workflow around PM notification. Can I apply run-time variables to a Query script to allow users to view their own notifications? Yes. Query enables users to apply fixed or dynamic criteria for download. During run time, they can supply values of the variables and retrieve their desired output. Can I apply my own workflows in Central? Yes. Central provides support for custom workflows. Users can create these workflows with workflow authoring tools like Nintex and deploy them on the Central site.